contribute to the general welfare of our school and the community of people around us. 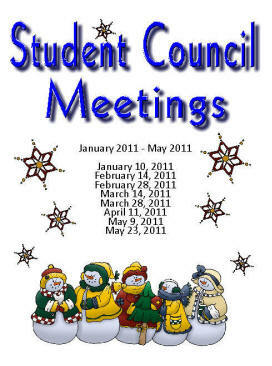 The Student Council will meet from 2:05 P.M. to 2:45 P.M. on the dates listed below. If your child is in Student Council please make arrangements to have them picked up by 2:45 P.M. on these dates. All Student Council members should bring a folder to meetings. The folder will be used for reminders, meetings/dates, and for note-keeping.